Mario Pavone, Thomas Chapin, Michal Sarin. 199x. Alto saxophonist and flautist Thomas Chapin formed this trio in September of 1989 to explore ways of creating suspense and drama with three instruments. The pared down format of horn, bass and drums freed Chapin to discover a tremendous variety of tonal textures, unfettered by the traditional jazz trio keyboard element. 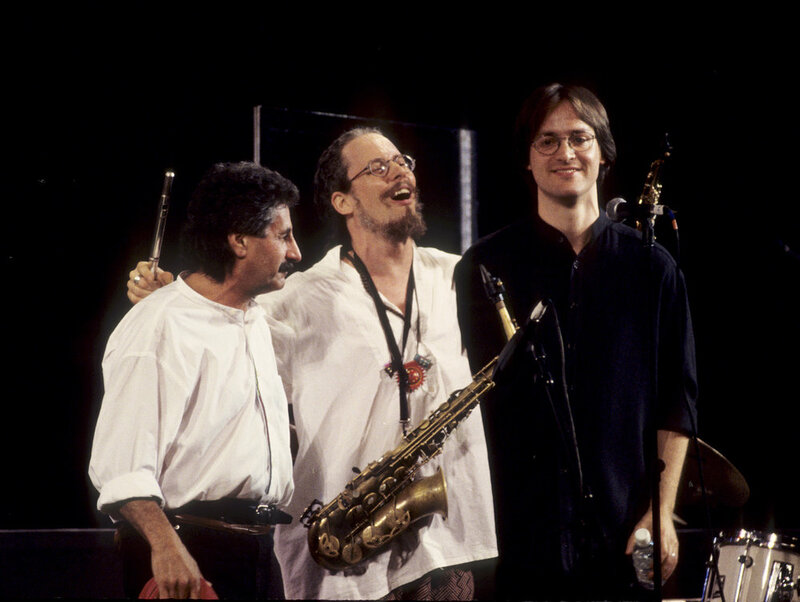 Joined by long-time musical associate Mario Pavone, the original drummer began with Pheroan AkLaff, followed by Steve Johns, and finally, by 1991, settling in with drummer Michael Sarin, this trio performed mostly original compositions that mix rock-style ostinatos, hard bop, rhythm and blues and free jazz. Described by critic Kevin Whitehead in Downbeat magazine as “hotly vamping, post-free jazz,” the TRIO’s music is largely original though occasionally drawing upon “the standards” as a point of departure for fresh interpretations. The Thomas Chapin Trio performed at jazz festivals in U.S. and abroad during the years 1989 until his death from leukemia in 1998. Festival appearances included the JVC Jazz Festival (NYC), the North Sea Jazz Festival (Holland), Newport Jazz Festival in Madarao (Japan), Molde Jazz Festival (Norway), Pori Jazz Festival (Finland), Glasgow Jazz Festival (Scotland), Jazz is Toulon (France), and the Ottaway International Festival (Canada), among many others. The Thomas Chapin Trio released eight albums, debuting in 1991 with THIRD FORCE. There were also expanded ensemble works including, the Trio Plus Brass’ INSOMNIA released in 1993 and the Trio Plus Strings’ HAYWIRE released in 1996. Released posthumously, ALIVE is an 8-CD boxed set of the Thomas Chapin Trio’s complete recordings, including a bonus live 1992 UC-Davis performance release, LIVE! ON TOUR. 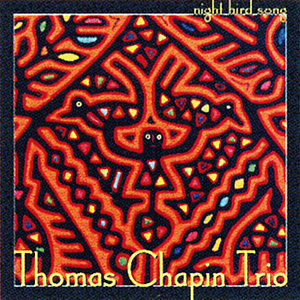 Within it is an eight-minute Enhanced CD Video of the Thomas Chapin Trio performing “Night Bird Song” at the Newport Jazz Festival in 1995. THOMAS CHAPIN, leader and composer, plays the alto saxophone and flute. He served as musical director for Lionel Hampton’s band from 1981-86, and was the reed player with the Chico Hamilton Quartet before forming his own trio. In addition in Ned Rothenberg’s Double Band, and a group called Machine Gun. MARIO PAVONE, bassist, has worked extensively with pianist Paul Bley, trumpeter Bill Dixon, and with Anthony Braxton. His membership in the trio continued a musical association with Thomas Chapin that began in 1981. A leader in his own right, Mr. Pavone has to date recorded over a dozen albums of his own. MICHAEL SARIN, drums, arrived in New York City from Seattle, Washington, where he studied with drummer Jerry Granelli, and performed with trombonist Julian Priester and vocalist Jay Clayton. In New York, in addition to his work with the trio, Mr. Sarin has performed with trumpeter Dave Douglas and saxophonist Ned Rothenberg.